Coffee tables created by today's finest North American furniture artists add function, beauty, and creative style to your home. Shop unique coffee tables handmade with exquisite craftsmanship and attention to detail from wood, metal, and other less traditional materials—perfect for the living room, family room, or any other room in the house. 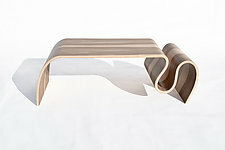 See the complete collection of artist-made tables for captivatingly original designs for furnishing your home.